Vegemite is a great and versatile spread. It contains many vitamins and nutrients needed in a healthy and balanced diet and is virtually fat free. It goes great on toast and gives you a healthy accompaniment for breakfast, lunch or snack. Comes in a handy tube, which is great when travelling. No need for a knife you can just squeeze it out. 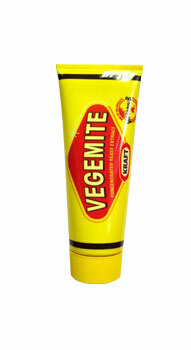 Vegemite is suitable for vegetarians and is kosher and halal certified. Yeast Extract (From Yeast Grown on Barley and Wheat), Salt, Mineral Salt (E508), Malt Extract (from Barley), Colour (E150C), Flavours (contains Celery), Niacin, Thiamine, Riboflavin, Folate.